The majority of people with gallstones have no symptoms at all. This is because the stones generally stay in the gallbladder and cause no problems. Sometimes, however, gallstones may lead to cholecystitis (inflamed gallbladder). Symptoms of gallbladder inflammation include: Pain on the right-hand side of the body, just below the ribs, Back pain, pain in the right shoulder, nausea, vomiting, sweating, restlessness. Sometimes the gallstones may pass down through the bile duct into the duodenum. When this happens the patient may experience biliary colic - a painful condition. The pain is felt in the upper part of the abdomen, but can also exist in the center of the abdomen, or a little to the right of it. Pain is more common about an hour after eating, especially if the patient has had a high-fat meal. The pain will be constant and will last a few hours, and then subside. Some patients will have non-stop pain for 24 hours, while others may experiences waves of pain. Infection - If the gallstones have caused a gallbladder infection the patient may have a fever and experience shivering. In the majority of gallstone infection cases the patient will be hospitalized and have the gallstone surgically removed. Jaundice - If the gallstone leaves the gallbladder and gets stuck in the bile duct it may block the passage of bile into the intestine. The bile will then seep into the bloodstream and the patient will show signs of jaundice - the skin and the whites of the eyes will be yellow. In most cases this complication will require the surgical removal of the gallstone. Some patients are lucky and the gallstone eventually passes into the intestine. The bile will then seep into the bloodstream and the patient will show signs of jaundice - the skin and the whites of the eyes will be yellow. In most cases this complication will require the surgical removal of the gallstone. Some patients are lucky and the gallstone eventually passes into the intestine. There are many other conditions that cause similar symptoms, including heartburn, pain caused by a heart attack, and liver problems. 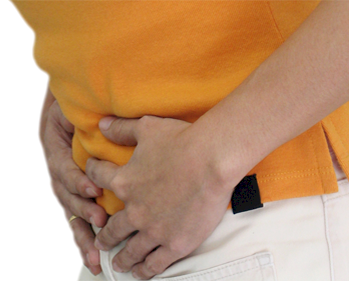 Stomach flu (gastroenteritis) and food poisoning also can cause symptoms similar to gallstones. Diarrhea and vomiting occur with the flu and food poisoning, but the pain tends to come and go rather than be constant. Also, pain with these conditions may be felt all over the belly, rather than in one spot. 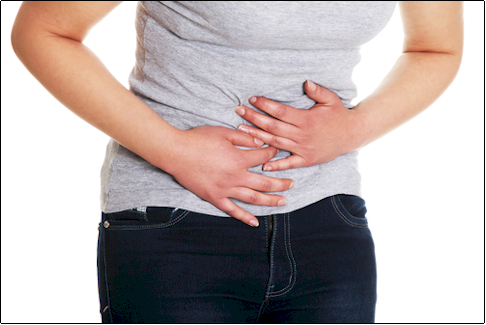 Belly pain that comes and goes (rather than being constant) and that occurs with nausea and vomiting and possibly a mild fever is more likely to be caused by stomach flu or food poisoning than by gallstones. This is especially true if others around you are sick with similar symptoms. Symptoms of a gallbladder attack are nonspecific and should be evaluated by a skilled clinician. They can be confused with symptoms of peptic ulcer disease, cardiac chest pain, esophageal chest pain, gastroesophageal reflux disease, irritable bowel syndrome, hepatitis and pancreatitis. Gallstones can be a cause of pancreatitis. 70-80% of people with gallstones never know they have them. These are called "silent gallstones". However, the remaining 20-30% still results in 500,000-700,000 gallbladder removals every year. And since the diet of the general American population is not improving, those numbers are rising.